Objective Taxation equitably reduces smoking, the leading cause of health inequalities. The tobacco industry (TI) can, however, undermine the public health gains realised from tobacco taxation through its pricing strategies. This study aims to examine contemporary TI pricing strategies in the UK and implications for tobacco tax policy. Design Review of commercial literature and longitudinal analysis of tobacco sales and price data. Setting A high-income country with comprehensive tobacco control policies and high tobacco taxes (UK). Participants 2009 to 2015 Nielsen Scantrak electronic point of sale systems data. Main outcome measures Tobacco segmentation; monthly prices, sales volumes of and net revenue from roll-your-own (RYO) and factory-made (FM) cigarettes by segment; use of price-marking and pack sizes. Results The literature review and sales data concurred that both RYO and FM cigarettes were segmented by price. Despite regular tax increases, average real prices for the cheapest FM and RYO segments remained steady from 2013 while volumes grew. Low prices were maintained through reductions in the size of packs and price-marking. Each year, at the point the budget is implemented, the TI drops its revenue by up to 18 pence per pack, absorbing the tax increases (undershifting). Undershifting is most marked for the cheapest segments. Conclusions The TI currently uses a variety of strategies to keep tobacco cheap. The implementation of standardised packaging will prevent small pack sizes and price-marking but further changes in tax policy are needed to minimise the TI’s attempts to prevent sudden price increases. Tobacco tax increases are the most effective and inexpensive way of reducing tobacco smoking prevalence,1–9 consumption,10 11 initiation12 13 and inequalities in smoking.14–17 Previous work revealed that, between 2000 and 2009 in the UK, the tobacco industry (TI) differentially shifted tax increases—absorbing tax increases on the cheapest cigarettes to keep them cheap (undershifting) while overshifting taxes on more expensive cigarettes to maximise profits.18–20 Consequently, the price of the lowest priced brands remained steady in real terms and the range between the cheapest and most expensive cigarettes increased. Similar TI pricing strategies have now been confirmed in other jurisdictions21–23 implying that this is an area of global concern. 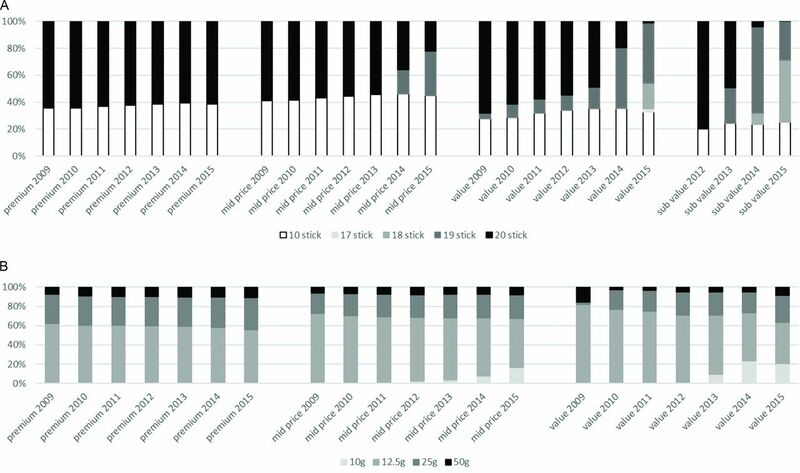 Our previous 2000–2009 study18–20 examined only packs of 20 FM cigarettes using bi-annual data. Nothing is yet published on RYO price segmentation or what other pricing approaches the TI is now using. Little is also known about how prices vary through the year in response to tax increases. This study therefore aims to address these gaps by analysing commercial literature, monthly price sales and tax data to determine the strategies the TI is currently using to keep FM and RYO tobacco cheap including the extent and patterns of undershifting. Given the lack of research in this area and growing rates of RYO use in diverse jurisdictions, the results will be globally relevant. In the UK, three types of tax are applied to tobacco: specific tax (a fixed amount per 1000 cigarettes or 1000 g of RYO tobacco), ad valorem tax (a proportion of the retail price) and value added tax (VAT, another ad valorem tax applied to most goods and services). Compared with ad valorem taxes, specific taxes tend to narrow the price range between premium and value brands, maximise the impact of tobacco taxes31–33 and raise more revenue.34 Since our previous project, UK tobacco taxes have increased annually, their structure has changed somewhat and the rate of VAT has varied (table 1). Most notably, since March 2010, tax increases between 1% and 5% above inflation have been specified each year for all tobacco products.35 In 2011, the UK increased the relative contribution of specific versus ad valorem tax for FM cigarettes36 and specified greater increases in taxes on RYO in an attempt to close the gap between FM and RYO prices. All tax changes were enacted annually each March with the exception of the 2009 change which took place in April. A review of the commercial literature covering 2008–2014 was undertaken in order to explore how the TI was pricing its products, including the price segmentation used and whether other approaches were used to keep tobacco cheap or alter its price. Mentions of tobacco pricing and segments between 2008 and 2014 were collated from: tobacco company annual reports and presentations to investors; financial analyst reports; market reports (Euromonitor, Mintel, Keynote) and trade magazines (Retail News, The Grocer, Wholesale News and Tobacco Journal International), plus relevant articles from Forecourt Trader, Convenience store and Asian Trader (2014 only) collated for a related literature review. Finally, the segment descriptors identified in the literature were used as search terms in a Google.co.uk search. Like other products, tobacco brands can be arranged within a hierarchical architecture (see online supplementary table S1). Drawing on existing hierarchies,40–42 we used the following four-level hierarchy: brand (eg, Marlboro), brand family (eg, Marlboro Bright Leaf), brand variant (eg, Marlboro Bright Leaf Platinum) and, at the lowest level, stock keeping unit (SKU) (eg, Marlboro Bright Leaf Platinum 10 stick pack, single pack, price marked). Nielsen data were provided at SKU level, each SKU identifiable via an individual bar code. For each SKU, Nielsen identifies the brand family and variant, the number of sticks per pack for FM and grams per pack for RYO, whether sold in a single or multipack and (from August 2011) whether sold in a price marked pack. Data available for each month included: the total value of sales per SKU, the price per SKU, the number of SKUs sold, from August 2011 the number of FM sticks and kilos of RYO sold and from January 2013 the proportion of retailers to which each SKU was distributed. Data were analysed using SPSS V.22 and Microsoft Excel 2013. Consistent with our previous study,20 SKUs were allocated to price segments and price segment labels were identified based on the commercial literature review and an analysis of their relative pricing each month. Details are provided in online supplementary file 1. Having allocated SKUs to segments, we explored prices, volumes, use of price-marking and variation in pack sizes by segment. In order to lessen small number anomalies, analyses were restricted to SKUs which reached a market share of >0.008% for at least 3 months (see online supplementary table S2). Weighted average real prices20 by segment were calculated by weighting for volumes sold and adjusting for inflation (thus creating real prices) using the Consumer Price Index (CPI).43 For each segment, we assessed pack and stick prices. For the latter, one RYO stick was set to contain 0.5 g tobacco based on the latest available survey data showing this is the average weight per RYO stick in England44 and the UK.45 For pack prices, preliminary analysis showed that pricing patterns over time for different pack sizes were similar, so data on all pack sizes were pooled to calculate weighted average real prices by segment for FM and RYO. To understand whether the 2011 budget was successful in its objective of raising RYO prices, we compared the median monthly price rise in each RYO segment immediately after the 2011 budget enactment with median monthly price rises immediately following the other budget enactments and across the data series as a whole. As pack sizes changed over time, we assessed changes in sales volumes of FM and RYO over time using the number of sticks sold (again based on 0.5 g of tobacco per RYO stick). We assessed volumes in the tobacco market as a whole, for FM and RYO and by segment. To examine changes in pack size over time, we identified popular pack sizes and calculated the market share by pack size for each segment annually over the study period. We explored patterns in the use of price-marking (printing the price on the pack, normally in bright bold font) by calculating the percentage of price marked packs by segment and pack size each month. We also calculated real weighted average prices (as above) and the % difference between the prices of price marked and non-price-marked packs in each segment. Tax pass through, the extent to which tax increases are passed through to consumers via increases in prices, or absorbed by companies through reduced profits, was evaluated through estimating changes in net revenue per pack. Net revenue is the money the company retains from its sales once all tobacco taxes and VAT have been paid. From this net revenue, companies cover their costs of production and distribution with the remainder being profits. As such, any tax rises not pushed onto consumers reduce net revenue and profits earned. The government specifies tax changes in the annual budget (which occurred in March in all of the study years except 2009 when it was April (table 1)). Tobacco tax changes were implemented at the time of the budget enactments but VAT changes occurred in January 2010 and January 2011. The taxes for each pack (ad valorem, specific and VAT) were calculated and summed to deduce the total tax due (see online supplementary file 2 for methodology). This was then subtracted from the nominal pack price to estimate net revenue. Real net revenue was calculated by adjusting for inflation using the CPI and presented graphically by year and segment to examine patterns over time. To examine the extent to which taxes were passed to consumers following each budget enactment and whether this varied by segment and the size of the tax increase, the net revenue per pack (in pence) for the month immediately prior to the tax increase was subtracted from the net revenue for the next month (up to the next budget) to estimate the change in net revenue. Changes for all pack sizes were graphed and showed similar patterns. We therefore only present changes in revenue for a popular pack sizes (20 s for FM premium and mid-price, 19 s for FM value and subvalue, and 12.5 g for RYO). In addition to the creation of new, lower price segments, price-marking was used to sell selected SKUs at a cheaper price.54 This strategy was particularly noted for RYO55 and cheaper FM brands.56 Low pack prices were also maintained by cutting the amount sold per pack, for example from 20 to 19 sticks57 or launching smaller 10 g RYO packs.58 Other strategies included repricing brands from a high to a low segment,53 including papers and filters inside RYO tobacco packs (known as combipacks59) and launching MYO tobacco.60 Thus, more options were made available to smokers looking for cheap tobacco. 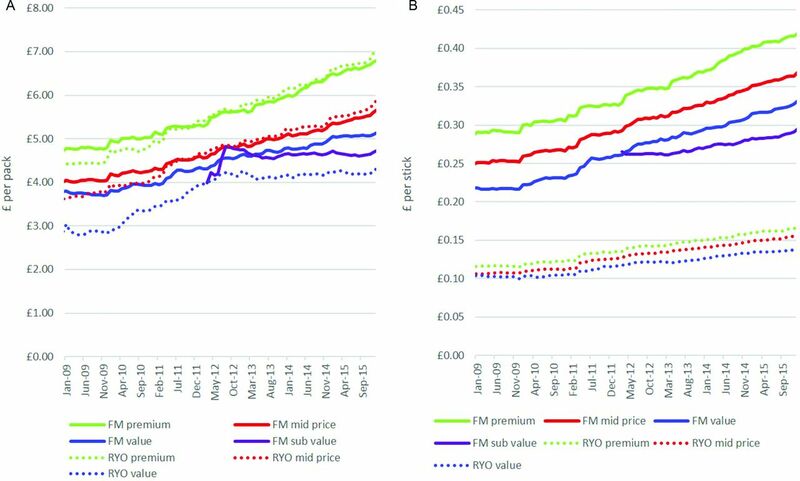 Based on the commercial literature review and analysis of the price data, we created three segments for both FM and RYO: ‘premium’, ‘mid-price’ and ‘value’, with the addition, from 2012 onwards, of a fourth ‘subvalue’ segment in the FM market (see online supplementary table S3). When examining real pack prices, the prices of FM and RYO products in the premium and mid-price segments were similar (figure 1A). In contrast, the price of the value RYO packs was considerably lower than value FM packs. Around the time of the 2011 tax increase on RYO, the price per pack of RYO premium and mid-price segments began to follow the respective FM pack prices rather than being cheaper. The gap between value FM and RYO packs also narrowed at this time but had widened by the end of the data series. Real price per pack and stick for RYO and FM (single packs only-all pack sizes)*. *The price of subvalue packs appears unstable initially as different pack sizes were introduced. FM, factory made; RYO, roll your own. Across the data series as a whole, the range in price per pack between the most and least expensive products within both FM and RYO increased. This is particularly so since 2012/2013 and is largely due to stagnation in the price of the cheapest products (figure 1A and online supplementary table S4). From January 2013 to December 2015, the real prices of the FM subvalue products actually fell 7 p and RYO value packs only increased by 2 p whereas the prices of premium FM and RYO products increased by £1.09 and £1.16, respectively. When comparing prices by stick, RYO sticks were considerably cheaper than FM (figure 1B). The increasing price range within the FM and RYO markets also occurred for stick prices. For example, the price range between cheapest and most expensive RYO segment widened from 2 p to 3 p per stick and for FM widened from 7 p to 13 p. This reflected smaller price increases in the cheaper segments. However, price increases were seen in every segment suggesting the fall in price of subvalue packs is attributable to the declining number of sticks per pack. Prices per stick also increased much faster among FM than RYO with the exception of subvalue FM. 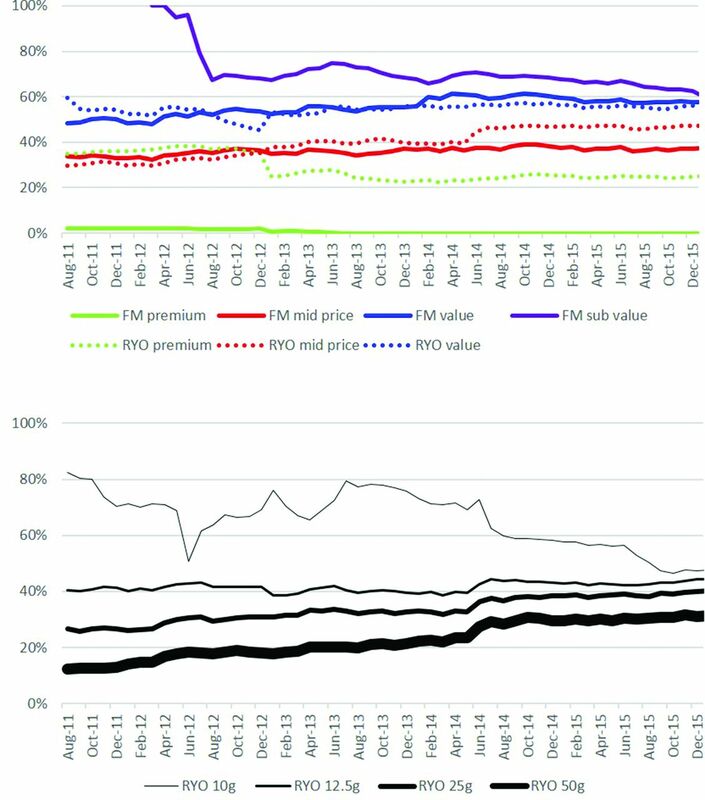 Thus, the range between the highest (FM premium) and lowest priced segments (RYO value) grew over time (£1.74 in January 2009 to £2.48 in December 2015). Nevertheless the gap between the cheapest FM and most expensive RYO changed little, again the result of the lack of price growth in the FM subvalue segment. After the 2011 budget, when the emphasis of tobacco tax changed towards specific taxation, the gap between the FM premium and FM value segments declined from a high of 7.9 p per stick in January 2011 to 6.6 p in February 2012. After this point, the subvalue segment brands began to be introduced. Moreover, prices per stick of all three RYO segments rose by their highest amount after the 2011 budget enactment-premium rose 0.72 p, mid-price rose 0.65 p and value rose 0.42 p in April 2011 compared with median monthly rises of 0.03 p, 0.04 p and 0.03 p, respectively overall and median monthly post budget rises of 0.20 p, 0.19 p and 0.07 p, respectively in the rest of the data period). Overall the total volume of FM and RYO sticks sold declined markedly in the UK: from 50.5 billion sticks in 2009 to 42.6 billion sticks in 2015 (a 13% decline) (figure 2A and online supplementary table S5). However, this overall decline consisted of a 17% decline in FM stick sales but a 46% increase for RYO sales, although RYO sales stabilised post-2012. Seasonal effects are apparent in both FM and RYO—New Year’s resolutions (and/or post-Christmas penury) impact tobacco sales. Volumes of sticks of FM sticks and RYO tobacco sold (A) overall and (B) by price segment. FM, factory made; RYO, roll your own. Changes in volumes of FM and RYO sticks sold varied by segment (figure 2B and online supplementary table S6). Within FM, annual volumes of premium and mid-price products declined markedly throughout the period (54% and 61% declines, respectively). Volumes of FM value cigarettes grew by 126% over the study period although growth slowed from mid-2011. From their introduction in 2012, volumes of FM subvalue have grown to 4.3 billion sticks in 2015. Within RYO, from 2009 to 2015 premium sales declined by 43% while mid-price volumes grew by 78% overall although have been stagnant since 2013 and RYO value grew to 2.3 billion stick equivalents although growth slowed after 2012. Thus, the market share of segments varied considerably over the study period. FM mid-price and RYO premium were the most popular of each type of product at the beginning of the study period whereas at the end of the study period FM value and RYO mid-price were most popular. The variety of FM pack sizes increased over the study period most notably with the introduction of increasingly smaller pack sizes (17–19 stick packs) to an increasing number of brands (figure 3 and online supplementary table S7). Market share of traditional FM 20 stick packs declined in all segments but most markedly in the value and subvalue segments where, by 2015, only 1% and 0% of volume, respectively were 20-packs. By 2015, the pack size with the largest share was 18 sticks for the subvalue segment (46% share), 19 sticks for the value segment (45% share) and 10 sticks for the mid-price segment (45% share). Market share of major FM and RYO pack sizes. FM, factory made; RYO, roll your own. The most notable change in the RYO segment was the gradual advent of smaller, 10 g packs in recent years. This was seen most markedly in the mid-price and RYO value segments. For example, RYO mid-price 10 g packs increased from a 1% to 17% market share between 2009 and 2015. Throughout the study period, 12.5 g packs held the largest market share in all RYO segments but over time, this market share fell for all segments; for example, RYO premium 12.5 g packs declined from 62% market share in 2009 to 54% market share in 2015. Generally, the market share of largest pack size (50 g) grew slightly over the study period. For example, RYO premium 50 g packs increased from 8% market share in 2009 to 11% market share in 2015. Cheaper segments were more likely to be price marked than expensive segments (figure 4A and online supplementary table S9A). For example, between 60% and 100% of subvalue FM products were price marked compared with a negligible proportion of premium FM products. 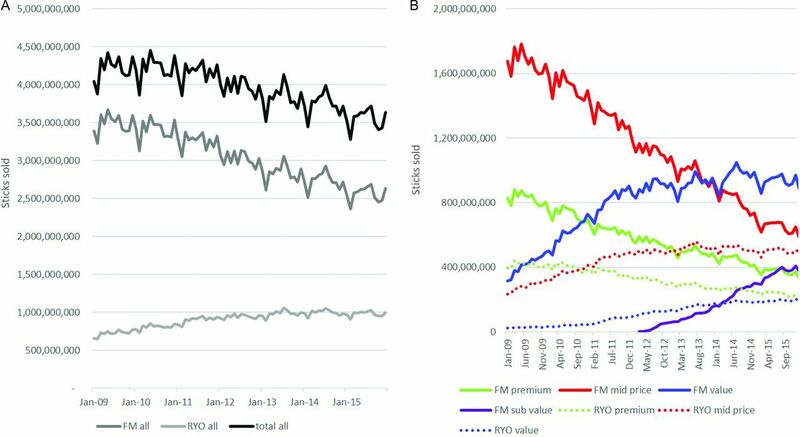 Patterns for RYO products were similar although a higher proportion of premium RYO products were price marked (36% in 2012 and about 25% thereafter) than premium FM products. Half of RYO value products were price marked. Differences between prices of price marked and standard packs varied over time and between segments (see online supplementary table S10). Percentage of packs price marked by (a) price segment and (b) pack size. Note: Nielsen data on price marking was only available from August 2011. FM, factory made; RYO, roll your own. For RYO, but not FM, smaller packs were also more likely to be price marked than larger packs (figure 4B and online supplementary table S9). For most segments and pack sizes price-marking appeared to increase gradually over time. However, there were notable exceptions to this pattern. When the new subvalue FM brands were introduced in early 2012, 100% were price marked but this then fell rapidly to between 60% and 70%. There was substantial price-marking of 10 g RYO packs prior to growth in the mid-price segment (2011) and when 10 g packs were introduced into the value segment (2013) (figure 3B). In addition, price marking on premium brands in both FM and RYO segments has fallen. Net real revenues were considerably greater for higher than lower priced segments although the gap was more marked for FM than RYO segments (figure 5 and online supplementary file table S11). A cyclical pattern of a drop in revenue immediately postbudget emerged with the 2011 budget and from this point there was progressively more differentiation in revenue between segments. Within the premium segment, revenue was greater on FM than RYO products while in the value segment, this pattern reversed and net revenues in the cheapest FM segment did increase throughout the whole period. Net real revenue per pack by price segment for popular pack sizes. FM, factory made; RYO, roll your own. Declines in net revenue at times of tax (VAT or tobacco tax) increases can be seen more clearly using changes in net revenue postbudget (figure 6 and online supplementary file table S12). A decline in revenue postbudget indicates undershifting (ie, the industry has absorbed the tax increase through a decline in profit) while an increase indicates overshifting (ie, the industry has increased profits on top of the tax increase). The point at which the change equals zero is the point at which the tax is fully shifted to consumers. Change in net real revenue per pack postbudget (difference in revenue per pack in each postbudget month compared with budget month) by price segment for popular pack sizes. Note. A change <£0.00 indicates undershifting and a change >£0.00 indicates overshifting. FM value 20 stick pack shown for 2009 because 19 stick pack was not available at the time of the budget VAT changes in January 2009 and January 2010. FM, factory made; RYO, roll your own. Every year and in every segment, in the month after the budget, net revenues fell. Thus, tobacco tax changes were not passed straight onto consumers but were initially absorbed by tobacco companies (indicating slightly lower profit per pack). In general, the extent and duration of the undershifting was greatest in the lowest segments while in higher priced segments the undershifting was less marked and often short-lived with profits recovering to and then exceeded prebudget levels (indicating overshifting) within 1–3 months each year. For example, in 2014, revenue on premium FM products recovered to prebudget levels by May and by the end of the budget year was up by 23 pence. By contrast, revenues on subvalue FM products fell in 2014 until August, and though they increased thereafter, never recovered to prebudget levels. Patterns varied somewhat by year reflecting the different tax changes. The years April to March 2009 and 2010 both saw VAT increases in January 2010 and January 2011, respectively. The declines in revenue at both these points indicate these VAT increases were absorbed by tobacco companies. The years 2011 and 2012 saw the most marked tax changes—2011 saw a shift to, and significant increase in, specific duties and a marked increase in the tax on RYO, while March 2012 saw an increase in taxes of 5% above Retail Price Index (compared with 1% increase in 2010 and 2% increases in other years in the data series). In line with this, after the 2011 tax system changes, a more marked pattern of initial undershifting and greater differentiation in revenue change by segment emerged consistent with the widening revenue gap between segments. This is the first study to provide a comprehensive overview of TI pricing including tax shifting throughout the year in both the FM and RYO markets. The commercial literature review and Nielsen data analysis both indicated that low priced FM and RYO tobacco products remained available throughout the study period via various pricing strategies including: launching new cheaper products; locking down the price of certain products through price-marking; introducing smaller packs and undershifting to ensure smaller price increases in the cheaper segments. Although real prices per stick have increased in all segments, real pack prices (and hence the price the consumer faces) of the cheapest FM and RYO products have remained static since 2012 largely due to the decline in pack sizes. Ten gram packs comprised a greater proportion of the cheapest RYO segments and were more likely to be price marked; thus the combination of small packs and price-marking appeared to be reinforcing. The price gap between FM and RYO was more complex: the gap in pack price appears to have narrowed between 2009 and 2012 particularly in the lowest segment (ie, between FM value and RYO value), signalling some success in using the 2011 tax changes to close the price gap. However, in terms of price per stick, the price gap increased across the dataset as a whole. Within RYO and FM, the range between cheapest and most expensive products has increased reflecting the differential shifting of taxes between segments. Hence, the opportunities for downtrading have continued to increase and volumes of the cheapest segments have grown in both FM and RYO. TI pricing appears designed to deliberately undermine the public health impact of tax increases. Each year, immediately postbudget, the TI cuts its profits by absorbing the tax increases and thus preventing any sudden increase in price the consumer would face, instead smoothing that increase throughout the year. The degree and duration of undershifting is, in general, most marked in the cheapest segments and in recent years is more marked in FM than RYO. The industry then drives up profits later in the year with the extent of overshifting most marked in the more expensive price-segments. This approach to pricing means tobacco prices in the lowest segments are kept artificially low and leads to the growing gap in price between the most expensive and cheapest products. Given that sudden large price rises are most associated with quit attempts,28 61 62 this pricing strategy and the consequent ongoing availability of cheap tobacco could reduce the incentive for price conscious smokers to quit.28–30 As such smokers are socioeconomically disadvantaged,9 this is likely to significantly exacerbate inequalities:14–17 UK data from October 2016 show smoking prevalence remains higher among the more disadvantaged (23.7%) compared with the more affluent (14.3%).63 As smoking is the leading cause of health inequalities64 this has significant implications. The prices we used for RYO cigarettes include only tobacco, not papers or filters. Currently papers cost between 0.2 and 0.6 p each and filters between 0.2 and 0.8 p each,71 72 adding between 0.4 p and 1.4 p per cigarette. The industry’s ability to introduce new cheaper variants of existing products40 could be restricted by allowing only one variant per brand as is the case with new legislation from Uruguay42 78 and/or freezing the introduction of any new FM or RYO brands which could be part of an ‘End-game’ strategy. The increase in tax on RYO in the 2011 budget had some success in narrowing the gap in the price between FM and RYO equivalent packs (despite the marked undershifting in the RYO value segment that year). However, a gap in price between product types still exists and is particularly marked when examining prices per stick. This and the fact that, within the value/subvalue segments, the degree of undershifting is now lower and profitability higher for RYO than FM, suggests there is scope for a further tax increase on RYO. The marked price differentials within the RYO and FM markets which arise from the TI’s differential shifting of taxes between segments also need to be addressed. The minimum excise tax,79 80 implemented in May 2017 should prevent tobacco being sold below a price floor, and these results suggest that this or a minimum consumption tax (which includes VAT) should be considered elsewhere. Within FM, a further shift to specific taxes would help. In addition, since the TI appears to be minimising sudden price rises which are more effective in stimulating quitting,28 61 62 the timing of tax increases could be made less predictable to make it harder for the industry to use pricing to undermine their public health impact. Furthermore, the government could stipulate only a couple of dates per year when price rises could be made to help ensure each tax increase is passed on in a timely manner and consider larger tax increases in anticipation of industry undershifting. In summary, cheap tobacco has been made available in the UK through TI strategies of absorbing tax increases in the cheapest segments, introducing new cheaper products, price-marking and reducing pack size for both FM and RYO. New approaches are needed, such as fully specific taxation, tax increases on RYO, restricting brands to one variant and preventing the introduction of new brands. Internationally, a minimum excise or consumption tax and standardisation of packs (to include a minimum pack size or weight and prevent price marking) is recommended. In the early 2000s, tobacco companies were making cheap cigarettes available in the UK through overshifting taxes on premium factory-made (FM) brands and undershifting taxes on cheap cigarette brands. When cheap tobacco is available smokers are less likely to quit smoking. Nothing is known about pricing of roll-your-own (RYO) tobacco. Tobacco companies take a similar approach to pricing RYO and FM with the price segmentation previously seen in FM now present in RYO. They are using a variety of strategies to ensure cheap tobacco remains available and to minimise the impact of tax changes: launching new cheaper products and smaller pack sizes, price-marking and undershifting taxes particularly in the cheaper price segments to smooth price rises consumers face and prevent sudden large increases. Consequently, price differences between the most expensive and cheapest products continue to grow both within and between FM and RYO, and volumes are only growing in the cheapest price segments of each. Policy changes that will help include: considering both pack and stick price in setting taxes and accounting for the correct weight of tobacco in a RYO cigarette; a wholly specific tax structure; increasing taxes on RYO to approximate those on cigarettes; restricting brands to one variant and preventing the introduction of new brands. Internationally, a minimum excise or consumption tax and standardisation of packs (to include a minimum pack size or weight and prevent price marking) is recommended. The authors would like to acknowledge the support of our stakeholder advisory board which in addition to Professor Frank Chaloupka, University of Illinois at Chicago and Professor Robert West University College London, included representatives from Public Health England (PHE), Action for Smoking and Health (ASH), Her Majesty’s Revenue and Customs (HMRC) and the University of Bath Smokers’ Panel; additionally we would like to mention PHE and AC Nielsen who provided access to Nielsen Scantrak data, Howard Reed who checked some of our preliminary tax analysis and Cathy Flower who provided administrative support. European Commission. Final Report - PPACTE (Pricing policies and control of tobacco in Europe), 2013.
. socioeconomic status, and smoking behavior among male adults in Taiwan. Taiwan Journal of Public Health 2003;22:10–16. Australian Institute of Health and Welfare. Tobacco Smoking, 2017. http://www.aihw.gov.au/alcohol-and-other-drugs/data-sources/ndshs-2016/tobacco/. IARC. Effectiveness of tobacco and price policies for tobacco control. IARC hand books of cancer prevention, 2011:14. https://www.iarc.fr/en/publications/pdfs-online/prev/handbook14/handbook14-0.pdf. ASH. ASH analysis of tobacco tax increases in the United Kingdom. Sampford A: ASH, 2016. HMRC. HM Revenue and Customs Tobacco Bulletin-July 2016, 2016. Nielsen. Rugby world cup fails to halt falling supermarket sales 2015. http://www.nielsen.com/uk/en/press-room/2015/rugby-world-cup-fails-to-halt-falling-supermarket-sales.html (cited 24 Oct 2015). Nielsen. Retail measurement service design summary, 2017. ONS. Consumer Price Inflation time series dataset 2016. https://www.ons.gov.uk/economy/inflationandpriceindices/datasets/consumerpriceindices (accessed 2 Aug 2016).
. Taking stock: value is key for smokers. Retail Newsagent 2012;37.
. Imperial Tobacco launches Player’s as a sub value cigarette brand. Wholesale News 2012;42. Euromonitor. Smoking tobacco in the United Kingdom. London: Euromonitor International Limited, 2014. ICHEME. Annual General Meeting of the Aberdeen Members’ Group of the Institution of Chemical Engineers and Energy Through The Recession, 2013. UK: Aberdeen IChemE Member Group.
. Another Success Story. Retail Newsagent 2011;31. JTI. Benson & Hedges rolling tobacco. Talkingretailcom 2010 http://www.talkingretail.com/products-news/tobacco/benson-a-hedges-rolling-tobacco/.
. A Window of Opportunity. Wholesale News 2011:28. Wholesale News. Defiant Display. Wholesale News 2010 http://www.wholesalenews.co.uk/news/defiant-display.html.
. Light up your tobacco profits. Retail Newsagent 2012;30.
. What to stock tobacco RYO. Retail Newsagent 2013;40. Euromonitor. Tobacco in Western Europe. London: Euromonitor International Limited, 2014. Mintel. Convenience stores UK April 2014. London: Mintel Group Limited, 2014.
. Innovators on innovation. Retail Newsagent 2013;30.
. Natural American Spirit roll out with free papers. Retail Newsagent 2013;10.
. Make-Your-Own Cigarettes Launch in UK: Euromonitor, 2011.
. STS120720 Latest trends on smoking in England from the Smoking Toolkit Study, 2016.
. The validity and reliability of retail sales data for monitoring cigarette consumption in Scotland. Edinburgh: NHS Health Scotland, 2015. My Supermarket. Swan extra slim filter tips 2017, 2017. https://www.mysupermarket.co.uk/asda-compare-prices/Tobacconist/Swan_Extra_Slim_Filter_Tips_120.html. (Cited 2 Feb 2017). My Supermarket. Rizla Green Cigarette papers 2017, 2017. https://www.mysupermarket.co.uk/asda-compare-prices/Tobacconist/Rizla_Green_Cigarette_Papers_50.html. (cited 2 Feb 2017).
. The global e-cigarette market is set to be worth $32bn by 2021, and the UK market will grow to $5.67bn. CityAM 2016 http://www.cityam.com/255646/global-e-cigarette-market-set-worth-32bn-2021-and-uk-market. (14 Sep 2016). legislation.gov.uk. The standardised packaging of tobacco products regulations. ed. 829. Government UK, 2015.
ed. Official Journal of the European Union. Directive 2014/40/EU of the European Parliament and of the Council of 3 April 2014. European Union, 2014. Tobacco Control Laws. Country details for Uruguay 2016, 2016. http://www.tobaccocontrollaws.org/legislation/country/uruguay/summary. (cited 7 Oct 2016). HM Treasury. Budget 2009, 2009. http://webarchive.nationalarchives.gov.uk/20130129110402/http:/www.hm-treasury.gov.uk/d/bud09_completereport_2520.pdf. (accessed 22 Nov 2016). HM Treasury. Budget 2010, 2010. Available from. http://webarchive.nationalarchives.gov.uk/20130129110402/http:/www.hm-treasury.gov.uk/d/budget2010_complete.pdf. (accessed 22 Nov 2016). HM Treasury. Budget 2011, 2011. http://webarchive.nationalarchives.gov.uk/20130129110402/http://cdn.hm-treasury.gov.uk/2011budget_complete.pdf. (accessed 22 Nov 2016). HM Treasury. Budget 2012, 2012. http://webarchive.nationalarchives.gov.uk/20130129110402/http://cdn.hm-treasury.gov.uk/budget2012_complete.pdf. (accessed 22 Nov 2016). HM Treasury. Budget 2013, 2013. https://www.gov.uk/government/uploads/system/uploads/attachment_data/file/221885/budget2013_complete.pdf. (accessed 22 Nov 2016). HM Treasury. Budget 2014, 2014. https://www.gov.uk/government/uploads/system/uploads/attachment_data/file/293759/37630_Budget_2014_Web_Accessible.pdf. (accessed 22 Nov 2016). HM Treasury. Budget 2015, 2015. https://www.gov.uk/government/uploads/system/uploads/attachment_data/file/416330/47881_Budget_2015_Web_Accessible.pdf (accessed 22 Nov 2016). HMRC. HM Revenue and Customs Value Added Tax (VAT) Bulletin - July 2016, 2016. ONS. UK Consumer Price Inflation: Oct 2016. Statistical bulletin 2016 November 2016. https://www.ons.gov.uk/economy/inflationandpriceindices/bulletins/consumerpriceinflation/latest. ONS. Users and uses of consumer price inflation statistics 2016, 2016. https://www.ons.gov.uk/economy/inflationandpriceindices/methodologies/usersandusesofconsumerpriceinflationstatistics (cited 29 Dec 2016). ONS. Consumer Price Indices, December 2012, 2013. http://webarchive.nationalarchives.gov.uk/20160105160709/http://www.ons.gov.uk/ons/rel/cpi/consumer-price-indices/december-2012/index.html (cited 29 Dec 2016).
. RPI versus CPI: what’s the difference? Why does it matter? Will it make you poorer or richer? Significance 2013 https://www.statslife.org.uk/economics-and-business/33-rpi-versus-cpi-what-s-the-difference-why-does-it-matter-will-it-make-you-poorer-or-richer. Contributors ABG designed the study. ABG, RH and JRB contributed to the development of the analysis plan. RH conducted the review of commercial literature, the analysis of Nielsen data and the drafting of the paper. ABG and JRB also contributed to the drafts. JRB provided economic expertise. AM, TRP and SCH commented on the analysis at all stages and drafts of the paper. Funding This project is funded by the National Institute for Health Research (NIHR) Public Health Research (PHR) programme (grant number 13/43/58). NIHR is funded by the UK Department of Health to improve the health and wealth of the nation through research. Disclaimer The views and opinions expressed therein are those of the authors and do not necessarily reflect those of the Public Health Research programme, NIHR, NHS or the Department of Health. AG, RH, SH, AM and TP are members of the UK Centre for Tobacco & Alcohol Studies, a UK Clinical Research Collaboration Public Health Research: Centre of Excellence whose work is supported by funding from the Medical Research Council, British Heart Foundation, Cancer Research UK, Economic and Social Research Council, and the National Institute for Health Research under the auspices of the UK Clinical Research Collaboration (MR/K023195/1). Competing interests All authors have completed the Unified Competing Interest form (available on request from the corresponding author) and declare no financial relationships with any organisations that might have an interest in the submitted work in the previous three years and no other relationships or activities that could appear to have influenced the submitted work. Ethics approval Ethical approval was obtained from the University of Bath Ethics Committee. Author note The lead author (the manuscript’s guarantor) affirms that the manuscript is an honest, accurate, and transparent account of the study being reported; that no important aspects of the study have been omitted; and that any discrepancies from the study as planned (and, if relevant, registered) have been explained. Correction notice This article has been corrected since it published Online First. The sentence “RYO segment widened from 10 p to 16 p per stick" has been corrected to “RYO segment widened from 2 p to 3 p per stick". At the end of the following paragraph, the sentence "Nevertheless the gap between the cheapest FM and most expensive RYO changed little, again the result of the lack of price growth in the FM subvalue segment. " was added.